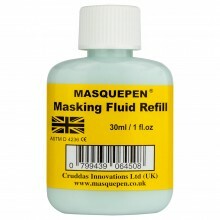 A reservoir of blue masking fluid with a built-in applicator, popular with artists and craftspeople. 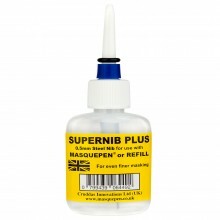 The Masquepen consists of a polythene reservoir containing 30ml of pale blue masking fluid. 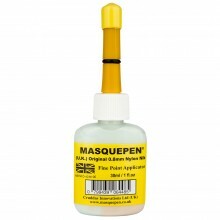 The applicator has a 0.8mm nylon nib, making masking out of fine areas such as petals, masts, windows, rigging etc so much easier.